Bryan and I are so excited to report about the girls progress. 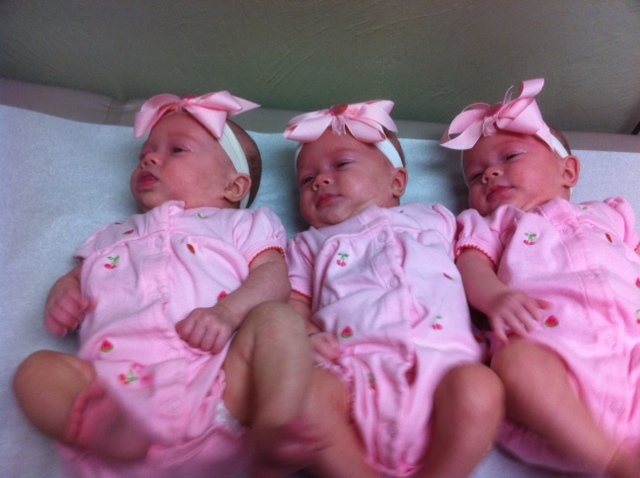 They had their four month well baby check up Monday along with more vaccinations. Bless their hearts there was way too many shots. Camdyn started crying even before the shots so bywhen the shots came around she was just in a tailspin. Fortunately, there was Bryan, myself, a nurse and our doctor to comfort. Avery is 9 pounds 14 ounces and 22 inches long! Camdyn is 9 pounds 10 ounces and 21 3/4 inches long! Emily is 8 pounds 15 ounces and 21 1/2 inches long! 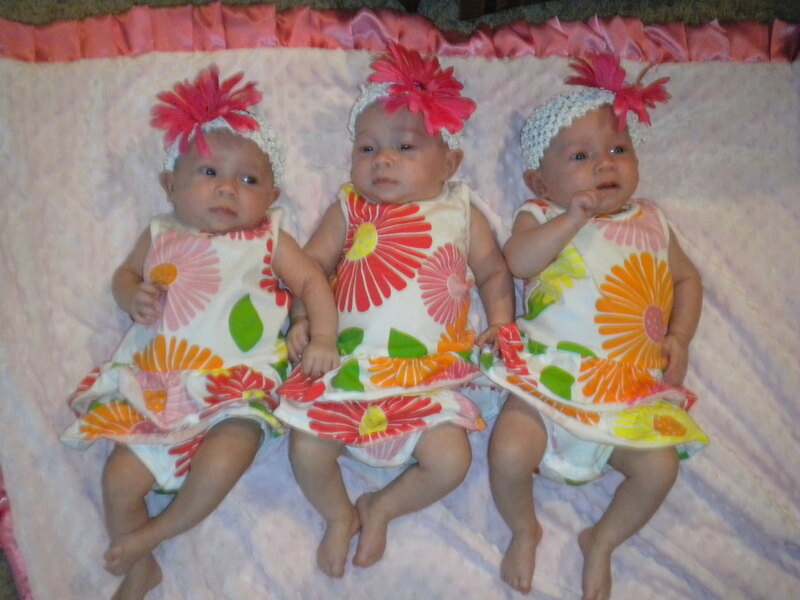 Doctor said they look wonderful and they are all within the 50% percentile for growth even as a premie. She has no concerns for their development and they are right on schedule. Medically, she said they give them up to age two to catch up with a “regular” baby, but these girls are already doing things that three and four month babies do. My heart melts at their smiles and they are already trying to roll over! When they are mobile then what do I do? I already sit down about thirty minutes out of the day. But, last night we had a huge night in terms of sleep! They slept from 11:15 p.m. until 4 a.m.! Five straight hours. You would have thought Bryan and I won the lottery! It was so great. We pray they have turned a corner but I am not going to get too excited just yet 🙂 I also had a huge accomplishment today. I traveled to Hobby Lobby and Target with the triplet stroller! The girls were awesome. It was the people watching that was a little awkward and took more time. I know people are curious so I am still at the point where I am entertaining the fascination people may have and also welcoming the comments. The nice ones that is…I still get the occasion, “I am glad its you and not me,” “How do you handle three?” or my favorite when we have the stroller out…”Are there really three in there?” I am so tempted to say, “Well, we have four but I left that one at home!” Again, I think I would be amazed it I saw this huge stroller and all these babies too so I try to relax when I am approached. Bryan was just looking through his phone at pictures of the girls from the first few weeks after their birth. I know I mention it a lot but we are still so amazed every day to see them now and remember where they came from. God has blessed us and we see it in their sweet faces every day. We are so lucky! 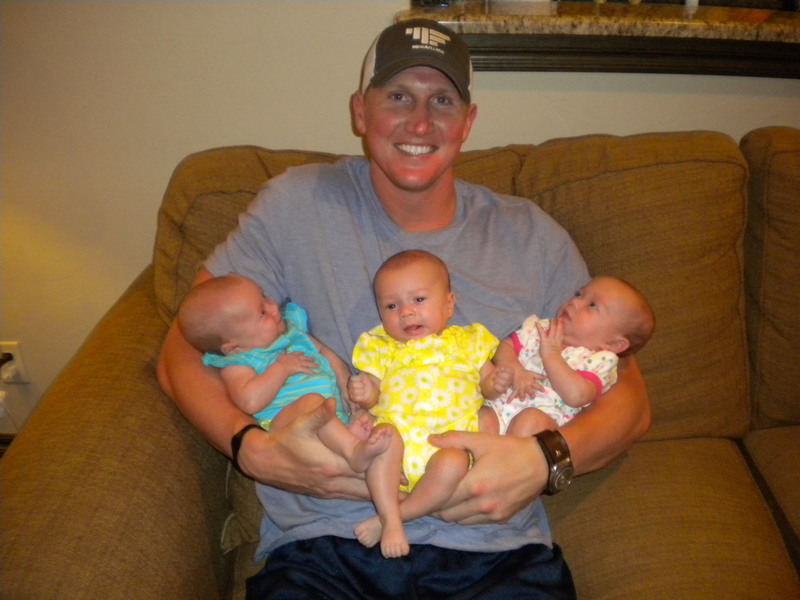 Last – (Uncle Grant with Avery (left) Emily (Center) and Camdyn (right) – Pretty darn cute pic huh? I almost started crying when I read how much sleep you got! It seems like a switch flips when they get ~8-9 pounds and their tummies miraculously get big enough to hold a good amount of food. It sounds like the fun is just beginning for you. Babies are so less fussy when they can sit up and play, and that’s just right around the corner. 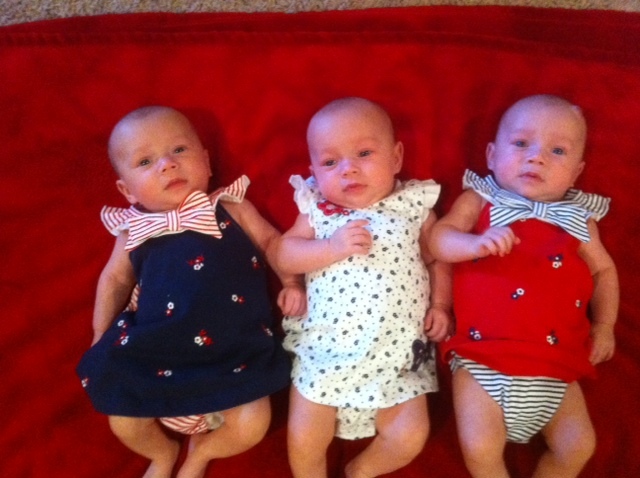 LOVE YOU, LOVE THIS BLOG AND LOVE THOSE BABIES! Keep up the great work, Mom! We haven’t stopped praying you and Bryan through yet!